Home » Flavours Blog » Cook like a local: Italian pasta pairing rules! Cook like a local: Italian pasta pairing rules! If you’ve been a guest on our cooking holidays in Italy, you may be aware: knowing how to match the right pasta with the correct sauce is a birth given talent for most Italians. Today, on world pasta day, we will continue to unravel the secrets of the perfect pasta pairings! For pastas such as spaghetti, linguine or vermicelli light, olive oil based or creamy sauces are best. Thinner pasta shapes can easily be overwhelmed with too heavy a sauce; so for pasta such as spaghetti go for a lighter sauce such as spagehetti alle vongole (spaghetti with clams). Another delicious sauce for the thinner shaped pasta is the famous carbonara sauce based on egg, cheese and bacon. For tagliatelle, pappardelle and fettuccine they can take thicker, meaty sauces. For examples, in Tuscany, pappardelle is served with wine-and-tomato-based duck or rabbit sauces. 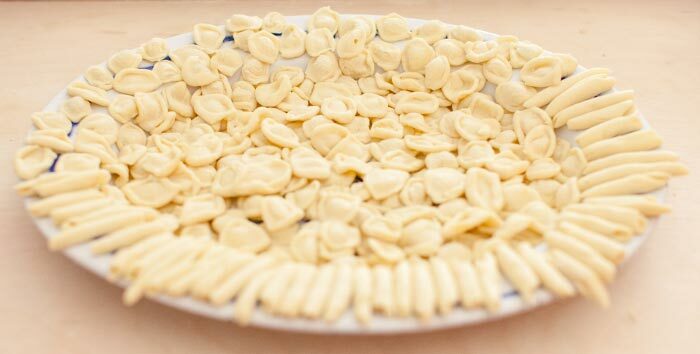 For pasta shaped like a shell; such as Conchiglie is best served with heavy cream or meat sauces. Large pasta shells can even be stuffed. A great way to serve conchiglioni rigati (large shells) is stuffed with a spinach and ricotta filling, baked and then served with a tomato sauce. Twisty pasta shapes such as fusilli and trofie are wonderful with lighter, smoother sauces that they can cling to twists. For example, freshly made pesto is a great match. Tubular pasta types such as penne, rigatoni and macaroni, are great with baked cheese sauces or chunky vegetable sauces. Tube shaped pasta is also great with Bolognese or ragu. For tiny pastas the best way to serve is in salads or side dishes. For example, orzo is great with a sauce of fresh tomato, basil and olive oil and can be served as a light meal. For example: Ravioli, tortellini and cappelletti. As this pasta is filled with lots of flavour they are traditionally served with a very simple buttery or oil sauce. One of our favourites is pumpkin ravioli with a butter and sage sauce – bellissima! If you want to learn more about Italian cooking secrets from our experienced and local chefs check our Italian cooking holidays or simply give us a call – our experienced team is more than happy to answer any questions you might have!